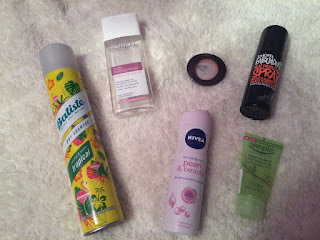 When I thought about doing an empties post, I'll admit that I didn't think I'd actually end up doing one. I didn't think I'd get through enough products in a month to actually make such a post worthwhile. But I came away from February with six product empties, which is at least four more than I would have predicted. It would have been more had I saved the packets my Lush bath bombs were in... but I'll remember that for next time! I feel like everyone has their preferred scent when it comes to Bastiste dry shampoo. This one is mine! I love getting that odd whiff of coconut throughout the day. I also buy the big 400ml cans as this is such an essential for me. When it comes to Micellar water, everyone seems to love the Garnier one but this L'oreal one is my favourite. It takes my makeup off better than anyone other water I've tried and my skin feels super clean and fresh after I've used this. I always make sure to buy a new bottle when I'm close to running out. Not alot to say about this one, it's a deodourant and it works! Nivea is my brand of choice when it comes to anti-perspirant. No7 Natural Blush in Soft Damson. How much pan has to be showing before you class a blush product as empty?! I've had this blushers for ages, we're talking years here. It's a beautiful soft pink that has served me well. I've since fallen for other blushers since I first bought this and there's other brands out there that I want to try so I won't be rushing out to repurchase this just yet. The fact that this is now a discontinued product should be a clue to how long I've had this. Unfortunately I'm rubbish at remembering to use heat protection before attacking my hair with straighteners so this 125ml spray that shouldn't have lasted that long at all, has remained with me for years. Not to mention, it fell out of favour the one time I grabbed this instead of make up setting spray... Don't spray it on your face, it isn't pleasant. Now I've bought a different heat protector. I'm making sure I use it religiously. I love love Love Simple. It's a brand I trust and will remain loyal to for years to come. As someone with sensitive skin, it's my go to brand. I'll be the first to hold my hands up and admit that I'm a bit of a Simple junkie. Definite Repurchase! What products did you use up in February? Book Series I've Been Loving Recently.